He comes from a family that had people in senior positions in the Church. His father was rector at Fakenham and has his name appearing in several church based activities. But it is his military career that is causing some mystery as he was awarded the Military Cross in the 1918 New Year Honours, which Bob presumed was for his service in Palestine and maybe the Battles for Gaza. We have been supplied with a couple of photos featuring Cpt. Caton and would love to know if any of our other readers can fill in any more of the details, especially surrounding his Military Cross. Left to right, Back row: Lt. VCC Corke Lt. TN Flatt, Lt WW Flatt, 2/Lt EM King, Lt WV Morgan, Lt GK Hampton, 2/Lt GCH Culley, Lt B Boswell, Lt HM Taylor, 2/Lt SJ Steel, 2/Lt Collison, 2/Lt RB Caton, 2/Lt JH Jewson, Lt RW Moore, Q-M. Middle row: Capt. GHK Fisher, Capt. WH Jewson, Capt. SD Page, Capt. CWW Burrell, Maj. HR Fletcher, Lt. Col. JR Harvey DSO, Capt. CP Hines, Capt. EW Motgomerie, Adjutant, Capt. Rudd, Capt. HW Back, Capt. BM Hughes. 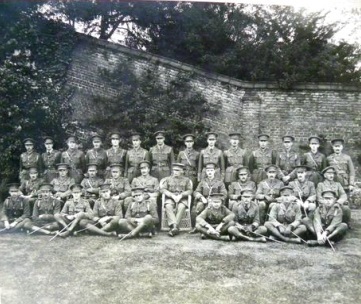 This image was snipped from a scan of a subsection of a larger, named team photograph of the 4th Bn officers taken in Bury St Edmunds, between early April and late May 1915. A note made in 2011 say it was May. The original is embedded. I do not own the copyright to the image and I no longer recall where I came across it. Perhaps an appeal to readers and archivists would ID its provenance (and help in my quest for a higher resolution scan of the original). This entry was posted in Information needed, research project and tagged Gaza, help needed, medals, Norfolk Regiment, Palestine. Bookmark the permalink.